Rahul Gandhi was arrested before he could reach Madhya Pradesh's Mandsaur. 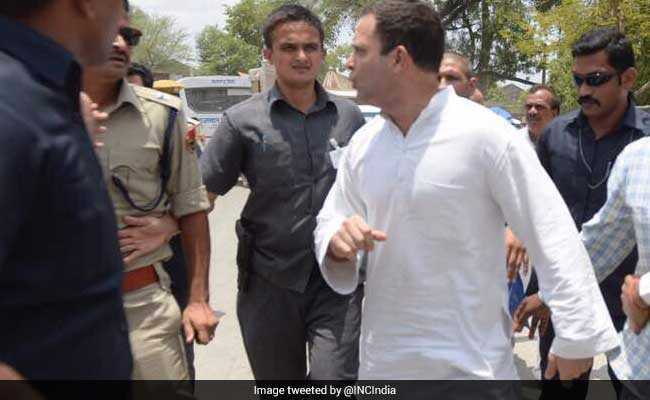 Naya Gaon, Madhya Pradesh: After a super busy day, Congress Vice-President Rahul Gandhi has been arrested in Madhya Pradesh's Neemuch area where he finally managed to reach after a lot of resistance en route from state police departments. He was on his way to Mandsaur, the epicentre of violent farmer protests that have escalated over the death of five in police firing, to meet the families of the victims. After tweeting about his visit yesterday, Mr Gandhi began his adventurous journey this morning. The Gandhi scion couldn't reach Mandsaur, but as soon as he crossed the Rajasthan-Madhya Pradesh border, he accused Prime Minister Narendra Modi of "waiving loans of the country's rich", but "doing nothing for the poor farmers". While speaking to reporters, he lashed out at the Centre and the Madhya Pradesh government saying both PM Modi and Chief Minister Shivraj Chouhan were responsible for the deaths of farmers in Mandsaur. He said that PM Modi could waive loans worth Rs 1.50 lakh crore of the rich but not of farmers. "He can't provide the right price for their agricultural produce, can't give them bonus, can't give compensation... He can only give them bullets." Hundreds of Congress workers as well as senior leaders like Rajasthan Congress chief Sachin Pilot and Madhya Pradesh legislator Jaiwardhan Singh also courted arrest while trying to make their way to Mandsaur. They were taken to a guesthouse of a cement company, a police official said. The ruling BJP has accused him of exploiting the protests for political gain.